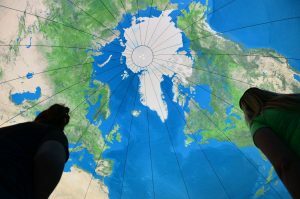 The Earth Balloon allows students to learn about geography, earth science and environmental science. It promotes map skills development, and is an interactive, hands-on exhibit – engaging and fun! ~ Students stand/sit on Antartica when inside The Earth Balloon. 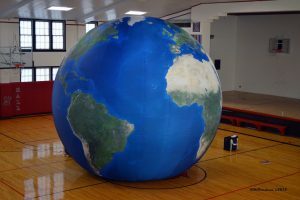 ~ Students can see the Earth in its entirety from inside The Earth Balloon. ~ The Earth Balloon is constructed of 24 panels, one for evey hour of the day to represent time zones. ~The Earth Balloon’s scale is 1″ on The Earth Balloon equals 30 miles on the Earth. ~ Set up can easily be done by one person, with access to one plug in, in about 10 minutes. ~ Take down can also be done by one person, in about 15 minutes. ~ Grade level specific and standards-based lessons focusing on water (quality/quantity), landforms, bodies of water, ecosystems, AND MORE! ~ Program can easily be adapted to specific needs and local requests. To schedule the earth balloon at your educational event contact your local conservation district.